Islami, S. Yahya, Tafakkor, Mina, Rezvani Zadeh, Forough. (1395). Richness in Architecture as Defined by Contemporary Iranian Television Series. معماری و شهرسازی آرمان شهر, 9(16), 15-27. S. Yahya Islami; Mina Tafakkor; Forough Rezvani Zadeh. "Richness in Architecture as Defined by Contemporary Iranian Television Series". معماری و شهرسازی آرمان شهر, 9, 16, 1395, 15-27. Islami, S. Yahya, Tafakkor, Mina, Rezvani Zadeh, Forough. (1395). 'Richness in Architecture as Defined by Contemporary Iranian Television Series', معماری و شهرسازی آرمان شهر, 9(16), pp. 15-27. Islami, S. Yahya, Tafakkor, Mina, Rezvani Zadeh, Forough. Richness in Architecture as Defined by Contemporary Iranian Television Series. معماری و شهرسازی آرمان شهر, 1395; 9(16): 15-27. 2M.A. in Interior Architecture, School of Architecture, College of Fine Arts, University of Tehran, Tehran, Iran. Today, mass media act like a magic mirror, not only reflecting the reality of societies, but also projecting a variety of images onto people’s thoughts. Because of this great ability to produce, reproduce and disperse images, mass media have acquired considerable influence on people’s lives. Among the different media, the television in particular has become an inseparable part of most Iranian households. Within the various programs offered, television series stand out from the rest because they are presented incrementally and over a longer period of time, and therefore, attracting large, faithful audiences who continuously absorb their visual communication. This paper traces people’s conception of richness, luxury and quality in architecture by examining its representation in recent Iranian TV series. It uses a qualitative research methodology based on theoretical cross-examination, critical analysis and thematic comparison of Iranian homes, particularly houses belonging to the wealthy with enough financial means to facilitate quality and creativity in architecture. 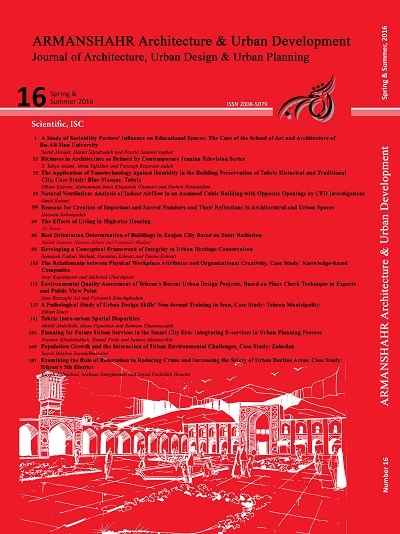 By analyzing the architectural characteristics of these buildings, this paper concludes that a particularly superficial definition of richness in architecture is gaining popularity, which results in architectural characteristics that are entirely foreign to the rich cultural and architectural traditions of Iran. The consequence is a loss of identity in which everyone is responsible for: from the wealthy clients who desire such imported opulence, to the architects who succumb to such desire, and finally the public that accepts it all. In this context, the media acts like a mirror, reflecting and therefore doubling the effect of these events. Aghapur, M. (2004). Evaluating the Performance of Islamic Republic of Iran Broadcasting. Tehran: High Council of Cultural Revolution, Supervisory Board of Culture and Science. Bani Mas’ud, A. (2010). Western Architecture. Tehran:HONAR-E ME’MARI-E QARN Press. Imamjome Zadeh, J., & Mahmud Oghli, R. (2011). Media and Building Post-Modern Social Identity. Communication Research, 67, 119-146. Islami, S. Gh. R., & Shahinrad, M. (2012). Recognition of the Principle of Horizontality in Islamic Architecture. KIMIAY-E-HONAR, 41-64. Islami, S. Gh., Nikghadam, N., & Islami, S. Y. (2015). Divine Vision: Islamic Arts and Horizontal Thought. Journal of Researches in Islamic Architecture. 3(2), 34-49. Kiani, M. (2007). The Architecture of the First Pahlavi Period. Tehran: Institute of Contemporary History of Iran, Natanz Press. Loos, A. (1998). Ornament and Crime. Michael Mitchell, Trans. Riverside: Ariadne Press. Mahmoudi, A. (2005). Overview of the Importance of Porch in the Traditional Home (with a Special Look at BAM). ONAR-HA-YE-ZIBA, 53-6. Pakzad, J. (2003). Phenomenology of Facade of Residential Buildings and its Proceeding. HONAR-HA-YEZIBA, 51-62.